This is one of the best Ssäm Bar dishes  a staple there since the late-night days and a fine way to dispatch either cauliflower or Brussels sprouts in season (see the variation). There's not too much of a story to it: we had a deep fryer, we had vegetables in season that we needed to cook, we had Tien's fish sauce vinaigrette on hand, and we were looking for a way to use boondi, a fried chickpea snack used in Indian cooking that Tien brought with him from his days working for Gray Kunz. They all found each other, and the results were awesome. Sometimes it's just that easy. Later we swapped out the boondi for puffed rice  which is what Rice Krispies are  seasoned with shichimi togarashi. 2. To fry the cauliflower: Heat 1½ inches of oil in a wide skillet over medium-high heat until a deep-fry or instant-read thermometer registers 375°F. Line a plate with paper towels. Fry the cauliflower in batches that don't crowd the pan for 4 to 5 minutes each, until the florets are golden and dotted with spots of brown. Drain on the paper towels. To roast the cauliflower: Heat the oven to 400°F. Put the florets in a large mixing bowl, add a splash of oil  enough to coat them, start with a couple tablespoons  and toss. Spread the cauliflower out on a rimmed baking sheet (or two  you want space around the cauliflower so it roasts, not steams) and pop into the oven. After 20 to 25 minutes, the cauliflower should be browned in spots and tender. Proceed. 3. Fry the cilantro leaves. If you fried the cauliflower, you're all set up. Make sure the leaves are dry and fry them by the handful, dropping them into the 375°F oil and agitating them with a slotted spoon or spider so they don't clump together. Give them 5 to 10 seconds to crisp, then drain on paper towels. If you roasted the cauliflower, heat about 1 cup of oil in a small sauté pan or skillet  the oil should be ½ inch or so deep  over medium-high heat until a deep-fry or instant-read thermometer registers 375°F. Fry, stir, and drain the leaves as directed. 5. Divide the cauliflower among four bowls (or serve it all out of one big bowl), top with the dressing, and toss once or twice to coat. 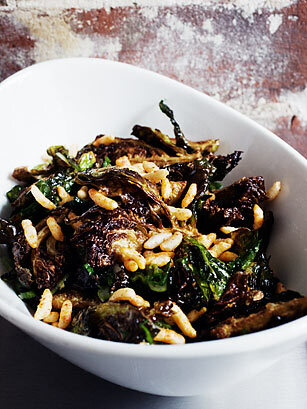 Sprinkle the fried cilantro and puffed rice over all, and serve. This recipe works equally well with Brussels sprouts. The method is almost exactly the same. You want about 2 pounds Brussels sprouts for 4 servings, and smaller Brussels sprouts are better than bigger ones for this dish, so if you're shopping at a market where you can pick out which you want, angle for the smaller guys. Peel away any loose or discolored outer leaves and cut the sprouts in half. If frying them, follow the instructions for frying cauliflower. Brussels sprouts will take about 5 minutes: when the outer leaves begin to hint at going black around the edges  i.e., after the sprouts have sizzled, shrunk, popped, and browned but before they burn  remove them to a paper towellined plate or tray. To roast them, heat 2 tablespoons grapeseed oil in an oven-safe wide skillet (12 to 14 inches) or 3-quart sauté pan over medium heat. When the oil slides easily from side to side of the pan, add the Brussels sprouts cut side down. When the cut faces of the sprouts begin to brown, transfer the pan to the oven to finish cooking, about 15 minutes. The sprouts are ready when they are tender but not soft. Proceed as above.